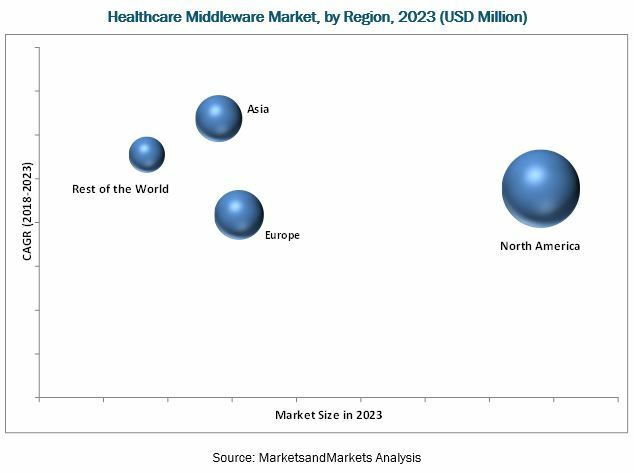 [170 Pages Report] The global healthcare middleware market was valued at USD 1.76 Billion in 2017 and is projected to reach USD 3.07 Billion by 2023, at a CAGR of 10.0%. The base year considered for the study is 2017 and the forecast period is from 2018 to 2023. The study estimates the healthcare middleware market size for 2018 and projects its demand till 2023. In the primary research process, various sources from both demand side and supply side were interviewed to obtain qualitative and quantitative information for the report. Primary sources from the demand side include medical researchers, hospital purchase managers, and academic research institutes. For the market estimation process, both top-down and bottom-up approaches were used to estimate and validate the market size of the healthcare middleware market as well as to estimate the market size of various other dependent submarkets. All possible parameters that affect the market covered in this research study have been accounted for, viewed in extensive detail, verified through primary research, and analyzed to get the final quantitative and qualitative data. This data was consolidated and added to detailed inputs and analysis from MarketsandMarkets and presented in this report. Secondary sources such as directories; databases such as D&B, Bloomberg Business, and Factiva; white papers; annual reports; company house documents; investor presentations; and SEC filings of companies were referred. The healthcare middleware market is highly fragmented with the presence of several small and big players. Prominent players in the market include Corepoint Health (US), Cerner Corporation (US), Epic Systems Corporation (US), Fujitsu (Japan), IBM Corporation (US), InterSystems Corporation (US), Oracle Corporation (US), Microsoft Corporation (US), Orion Health (New Zealand), Red Hat (US), Software AG (Germany), TIBCO Software (US), Ascom (Switzerland), Informatica (US), and Zoeticx, Inc. (US). The global healthcare middleware market is expected to reach USD 3.07 Billion by 2023 from USD 1.90 Billion in 2018, at a CAGR of 10.0%. Increasing utilization of smart devices, the availability of big data in healthcare, increasing need for data interoperability, and growing investments to overcome healthcare interoperability issues are the key drivers of the global market. This market is segmented on the basis of type, application, deployment model, end user, and region. By type, the market is segmented into communication middleware, platform middleware, integration middleware, and other middleware. The platform middleware segment is expected to command the largest share of the healthcare middleware market in 2018. Factors such as ease of deployment and use, easy interoperability, data security, portability, and cost-effectiveness are driving the growth of this segment. Based on application, the market is segmented into clinical, financial, and operational and administrative applications. 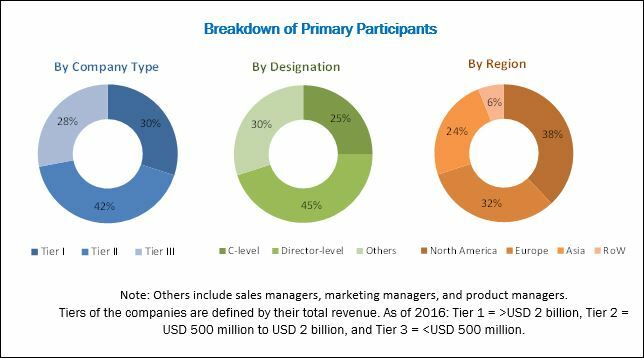 The clinical applications segment is expected to account for the largest share of the market and is projected to register the highest CAGR during the forecast period. Middleware solutions help in auto-verification of the clinical data and reanalyzing the data for accurate results. Moreover, these tools have the ability to track laboratory performance metrics. These benefits are fueling the adoption of middleware solutions in clinical laboratories. On the basis of deployment model, the market is segmented into on-premise, cloud-based, and hybrid models. In 2018, the on-premise models segment is expected to account for the largest share of the healthcare middleware market. This can majorly be attributed to the fact that on-premise models are more customizable than the other two deployment models. Based on end user, the market is segmented into healthcare payers, healthcare providers, life science organizations, and clinical laboratories. In 2018, the healthcare providers segment is expected to command the largest share of the market. Healthcare providers need to exchange and analyze large volumes of healthcare data to make critical decisions that impact individual patients as well as the entire healthcare system. In an effort to improve the quality of care and reduce costs, healthcare providers are increasingly turning to IT-enabled business strategies and analytics. This is expected to drive the adoption of healthcare middleware solutions among healthcare providers. In 2018, North America is expected to dominate the market followed by Europe. Asia is expected to grow at the highest CAGR during the forecast period. The high growth rate of the region is attributed to factors such as the growing focus of market players on emerging Asian countries, the emergence of big data in healthcare, and increasing spending on IT infrastructure by healthcare providers. However, data security concerns related to hosting data on the cloud and concerns regarding inaccurate & inconsistent data are the major factors that are expected to restrain the growth of this market. The healthcare middleware market is highly fragmented with the presence of several large as well as emerging players. Prominent players in the market include Corepoint Health (US), Cerner Corporation (US), Epic Systems Corporation (US), Fujitsu (Japan), IBM Corporation (US), InterSystems Corporation (US), Oracle Corporation (US), Microsoft Corporation (US), Orion Health (New Zealand), Red Hat (US), Software AG (Germany), TIBCO Software (US), Ascom (Switzerland), Informatica (US), and Zoeticx, Inc. (US).